Firefox 3.5 Soars Past A Million Downloads. Approaching 100 Downloads A Second. Mozilla today released Firefox 3.5 into the wild. Not surprisingly, it’s flying off the virtual shelves. And unlike when Mozilla released Firefox 3.0 last year, its servers are staying up and reliable, so the rate of downloads is pretty incredible. This site, run by Mozilla, shows the download stats for the new browser. Overall downloads are now approaching 1.3 million worldwide, with over 350,000 of those in the U.S. But even more amazing is the number of downloads occurring each second, it’s ranging from 59 to 95 right now. Again, that’s every second. Outside of the U.S., the browser is moving quickly in Germany, France and the UK. The claim is that it’s much faster than the previous iterations of Firefox, and based on just a quick run-through of my favorite sites, I’d say that is in fact the case. Though, to be fair, it’s hard to know if that has something to do with the fact that just about all my browser plugins are not yet working with this version. So how does 1.3 million downloads in a few hours stack up against its rivals? Well, the most recent browser to offer a major upgrade was Safari, which claimed 11 million downloads in 3 days. But those numbers are tricky because Apple includes Safari updates in its regular OS X software updates, so pretty much all OS X users were at least asked to upgrade after its launch. Still, Apple claimed that of the 11 million, some 6 million were users on Windows machines. And Firefox also pings users to do auto-updates when a new version is available. 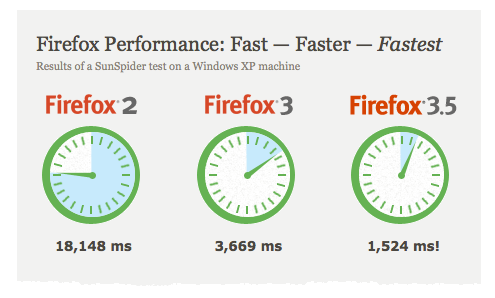 Despite its launch hiccups, Firefox 3 set the Guinness World Record for software downloads last summer. 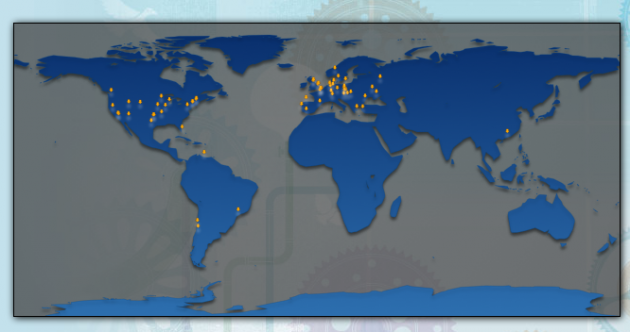 In just 24 hours, over 8 million people downloaded the browser around the world. We’ll see how this version stacks up. You can watch the live-updating chart and map for Firefox 3.5 downloads here.